Historian and author Dr. Gary Mormino is joined by historian Jeff LaHurd and real estate expert Harold Bubil for a “Conversations at the Crocker” event which explores how Sarasota, Bradenton and Venice were altered by World War II. Dr. Gary Mormino, esteemed authority on Florida and World War II will be joined by Sarasota-based historian and author Jeff LaHurd and Harold Bubil (Real Estate Editor, Sarasota Herald-Tribune) for a lively and informative conversation and illustrated presentation about how World War II powerfully impacted growth, housing, commercial development, politics and the cultural life of this part of Florida. Join us Tuesday, November 12, at 7 p.m. at the Crocker Memorial Church, 1260 12th Street (Pioneer Park), Sarasota. On the eve of Pearl Harbor, Florida was the smallest state in the South. Today it is a megastate and much of it is due to Florida being discovered and championed by soldiers and sailors who were stationed at Florida bases, went to war and returned to Florida in peacetime to buy property and settle here. Stories abound and personal recollections are common among families. Conversations at The Crocker lets you participate in this ongoing story. 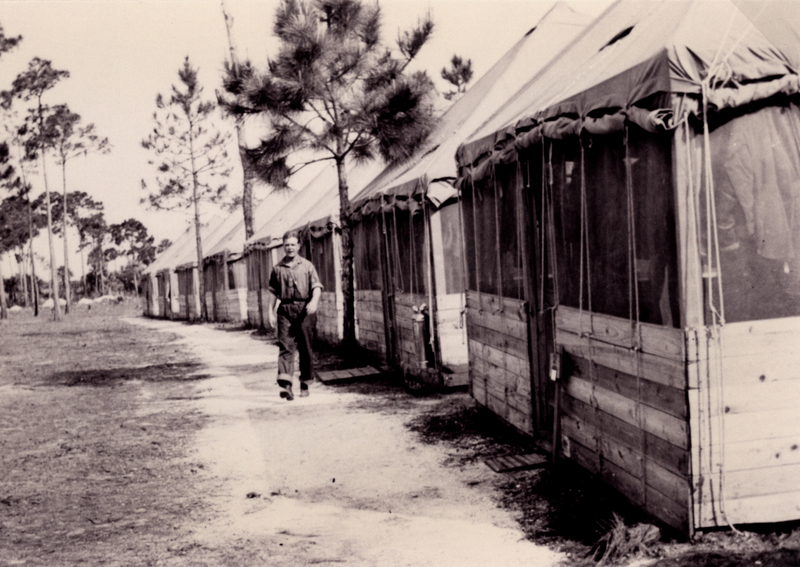 Military housing during WW II in Sarasota. Morimo, in his book Land of Sunshine, State of Dreams, quotes a GI writing to his mother: “This is the most beautiful place I have ever seen. Green palm trees, green grass, blue ocean and sky… I really think when the war is over, I’ll move down here.” He was one of thousands who made the same decision. You won’t want to miss the conversation about the World War II years when these three experts (all of whom have a sly sense of humor) engage one another and the audience in a spirited conversation about how this part of Florida was forever changed by World War II. Bring your own family memories to the Conversation and contribute!. Join the conversation on Tuesday, November 12 at 7 p.m. Enjoy the music of the World War II era as you arrive. The event, which is part of the series “Conversations at The Crocker,” is presented by the Historical Society of Sarasota County (HSOSC) and sponsored by SARASOTA Magazine. Conversations at The Crocker is an annual series of interactive programs focusing on various aspects of Sarasota’s past. HSOSC members, free; guests, $10. Proceeds from this series of Conversations help to support preservation efforts at the Bidwell-Wood House (1882) and the Crocker Memorial Church (1901). Photo from Sarasota County site. ← The TRUE story of Pirates!